At the turn of the century, a call, heard most loudly from the Democrats, was made favoring a Constitutional Convention for election reforms and a cleansing of the state government. The main goal of the convention was to disfranchise African Americans without technically violating the United States Constitution. Republicans and illiterate whites were afraid that they would be politically disfranchised along with African Americans. Democrats like State Chairman J. Taylor Ellyson, John Goode (President of the Constitutional Convention), and A.J. Montague (the party's nominee for governor) assured the white electorate that their right to vote would remain undisturbed as they sought to extinguish African-American suffrage. The referendum to hold the convention took place on May 24, 1900. Albemarle County, which includes Charlottesville, voted along with the majority of recorded votes in favor of the convention. In a special session on Feburary 16, 1901, the General Assembly passed the necessary legislation for the convention. 100 Delegates were selected based on representation in the House of Delegates. J.H. Lindsay and W.H. Boaz were elected to represent Albemarle County and the City of Charlottesville. The convention meetings began June 21, 1901, and continued for over a year. The major question before the delegation was how to bring about African-American disfranchisement without technically violating the 14th and 15th amendments to the United States Constitution. Raleigh C. Minor from Charlottesville offered and interesting solution in his letter to the members of the Constitutional Convention. He suggested PLURAL VOTING, granting upstanding white citizens TWO votes, while African Americans and lower-class whites would receive ONE. According to Minor this plan eliminates the inconvenience of equality of suffrage without completely disheartening African Americans. After lengthy debate, the suffrage proposal passed on April 4, 1902, by a vote of 67 to 28. 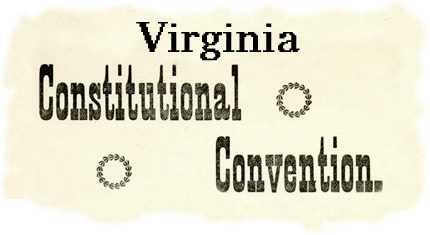 The new Virginia Constitution became law on July 10, 1902. The numbers of both white and African-American voters were significantly reduced. On October 4, 1902, The Daily Progress reported on the following Registration Drive. 755 whites and 84 African Americans were registered.